November 16, 2017, New York City — Blockchain technology is already driving innovation in the finance and public sectors globally. Now humanitarian and technology leaders are exploring how the technology could revolutionize humanitarian response to global complex emergencies. This transformation was explored at the Humanitarian Blockchain Summit on November 10 hosted by the Institute of International Humanitarian Affairs at Fordham University in partnership with the Centre for Innovation at Leiden University, Center of International Humanitarian Cooperation, University of Northampton, United Nations Office of Information and Communications Technology, and Civic Hall. More than 250 humanitarian workers, United Nations officials, governmental and public sector representatives, technology experts, and academics convened at the Summit to explore the vast potential of blockchain technology and grapple with the challenges. Blockchain — a distributed ledger technology — could be used to solve those challenges, such as storing identification, educational and professional qualifications of displaced persons; implementing direct cash transfer programs via cryptocurrencies; or managing contracts for migrant workers. “Blockchain can have a role in not only serving the people endangered in these crises, perhaps in refugee camps or disaster response, but also in finding new ways that allow people to be more self-reliant, long term humanitarian projects to be more inclusive, and protection to be more central to long term humanitarian response. As always the interest of humanitarians must go beyond the financial and fulfil the ultimate humanitarian principle of do no harm. The most essential objective we believe is to ensure transparency, data protection, and participation of beneficiaries by utilizing the blockchain through facilitating user centered design and ensuring their autonomy in the process,” said Brendan Cahill, IIHA Executive Director. Through panels, speeches, breakout sessions, and workshops attendees discussed topics such as humanitarian financing, ethical frameworks, smart contracts, gender empowerment, and sustainable development goals (SDGs) in relation to blockchain technology. Ground change and impact in evidence and open ourselves up to scrutiny. “We need collective effort and that does not just happen spontaneously. It takes the private sector, blockchain companies, coming to governments and actually saying we want standards, we want ethical codes…It takes an exchange of ideas, because we’re still so early in this process,” said Chandran who encouraged participants to continue engagement on the subject. Following the Blockchain Summit, the IIHA is launching the Blockchain for Humanity Initiative alongside the Centre for Innovation at Leiden University, University of Northampton, and University of Groningen. The Blockchain for Humanity Initiative will provide ongoing actions for further discussion and engagement with like-minded institutions and practitioners concerning the application of blockchain technology for humanitarian action. 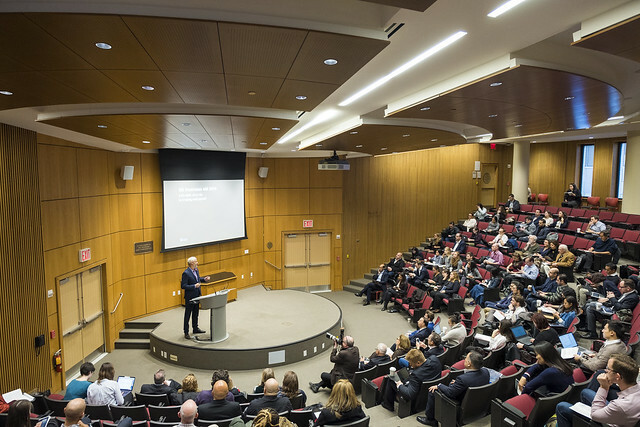 The Humanitarian Blockchain Summit was made possible with the generous support of Fordham Graduate School of Arts and Sciences, Consensys and Centre for Citizenship, Enterprise and Governance.